Print-your-own fabric web site Spoonflower and Robert Kaufman Fabrics have launched Fabric8 (http://www.fabric8contest.com), a contest to discover eight new, modern fabric collections from designers the world has yet to hear from. Submissions will be accepted through April 24, 2012, and one winner will be offered the chance to become a professional fabric designer. 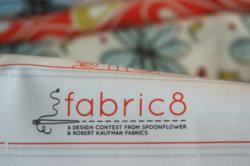 Fabric8 is a contest to discover the world's best amateur textile designers. Submissions are open through April 24, 2012. This competition brings together the cutting edge of crowd-sourced design with the traditional world of textile manufacturing. Spoonflower and Robert Kaufman Fabrics have launched a competition to identify eight of the world's best amateur textile designers and to offer one of those eight a once-in-a-lifetime chance to become a professional with a fabric collection available to crafters everywhere. Artists and designers from all over the world are invited to visit http://www.fabric8contest.com to learn how to submit a single fabric design by the contest deadline of April 24, 2012. The theme of the contest is textile designs inspired by pen and ink drawings colored with watercolors. Each of the eight finalists, selected by public voting from a pool of 100 semifinalists, will be asked to create a fabric collection around his or her original entry. Final voting on the eight collections will begin on June 7, 2012, with the winner announced a week later. The top designer will receive $1000, a design contract with Robert Kaufman Fabrics, a professional-quality Wacom digital drawing tablet valued at $1000 and $250 in custom fabric printed by Spoonflower. "Spoonflower makes it possible for anyone to create fabric," explains company co-founder Stephen Fraser, "and every day we see brilliant designs uploaded to Spoonflower by people trying their hand at surface design for the first time in their lives. The Fabric8 Contest provides an opportunity to shine a light on a few of these talented artists with the help of Robert Kaufman Fabrics, one of the most respected quilting fabric companies in the world." This competition brings together the cutting edge of crowd-sourced design with the traditional world of textile manufacturing to discover and encourage new talent and new approaches. While the first round of the contest will be juried, the final selection of the Fabric8 and the overall winner will rest entirely in the hands of the Spoonflower community. Following the April 24 entry deadline, a team of judges from Spoonflower and Robert Kaufman will choose 100 semi-finalists from the submitted designs. Starting on May 3, 2012, fabric lovers everywhere will help choose eight talented finalists via online voting at http://www.spoonflower.com. Each of the finalists -- the Fabric8 -- will receive $150 in custom-printed fabric from Spoonflower, be profiled online and have their work featured in promotional materials for the final round of the contest. Finalists will also be asked to design a collection, to include seven additional fabric designs, for a final round of voting open to the public. Spoonflower as a crowd-sourcing platform has already launched a handful of designers to success in the world of professional textile design. The site runs a weekly, themed design contest that draws participation from hundreds of aspiring designers and thousands of voters.